With corn planting nearly underway in the Corn Belt, farmers are finalizing their planting decisions. One of the last decisions may be corn population rates. Corn plant population has been a hot topic in recent years (here, for one example) and we decided to take a look into the data and evaluate the trends. The USDA provides insightful data on the topic. During the late summer and fall months, the USDA randomly selects fields from the top 10 corn producing states and conducts field measurements. These measurements are then used to make state and US yield estimates. One of these measures is the number of plants per acre. While data on the rates farmer plant is not available, we can get a good feel for what producers did based on the USDA’s plant counts. Data from Iowa has been collected the longest and is available back to 1963. Shown in figure 1, the state average corn population (reported as plants per acre) has shown a fairly consistent increase over the 51 years of data. Any departure from the general upward trend (a year that spikes up or down) is likely weather related (good planting conditions leading to strong emergence, or poor conditions leading the weak emergence). The general upward trend is what we are most interested in when thinking about plant population trends. It’s worth nothing that during the early 1970s corn population hovered around 18,750 plants per acre for several years. Populations stepped up during the late 1970’s and then temporarily plateaued around 21,000 plants per acre during the 1980s, likely corresponding the tough farm financial conditions producers faced during that period. Most recently populations peaked at nearly 31,000 seeds per acre 2011 and since dipped a little in Iowa. Looking at the big picture, it is safe to say the trend toward higher corn populations is not a new phenomenon. In fact, this trend has been fairly consistent over time. Many might find this surprising. 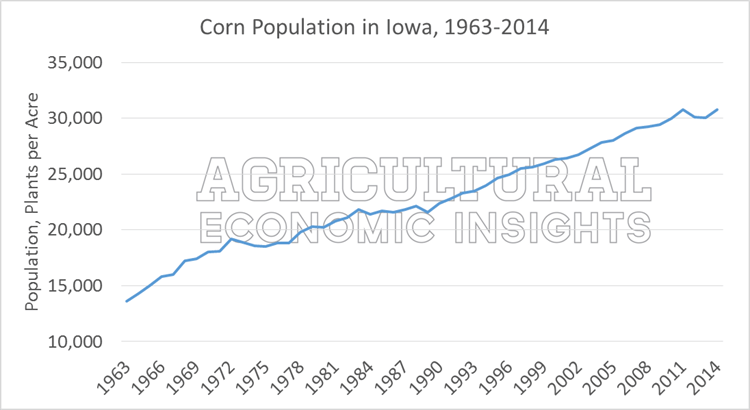 Although not shown, a trend line for this graph indicates that, on average, corn population in Iowa increased by 310 plants per acre per year. Very small changes over time, but these changes can really add up over the decades of a producer’s career. While corn populations have been at working higher for years, another aspect to consider is how populations vary across the Corn Belt. Shown in figure 2 are the state populations in 2014 (the USDA only has data available for these 10 states). Minnesota reported the highest population in 2014 at more than 31,000 plants per acre. Iowa, Illinois, Indiana, and Wisconsin also reported an overall state average corn population in excess of 30,000 plants per acre. On the low end, South Dakota and Kansas reported state average population less than 25,000 plants per acre. It’s worth nothing that these data are for all corn acres and where irrigated and non-irrigate corn production exists the data are aggregated. This is important to note in states such as Nebraska where both practices are common and the reported data many be tricky to interpret. Figure 2. 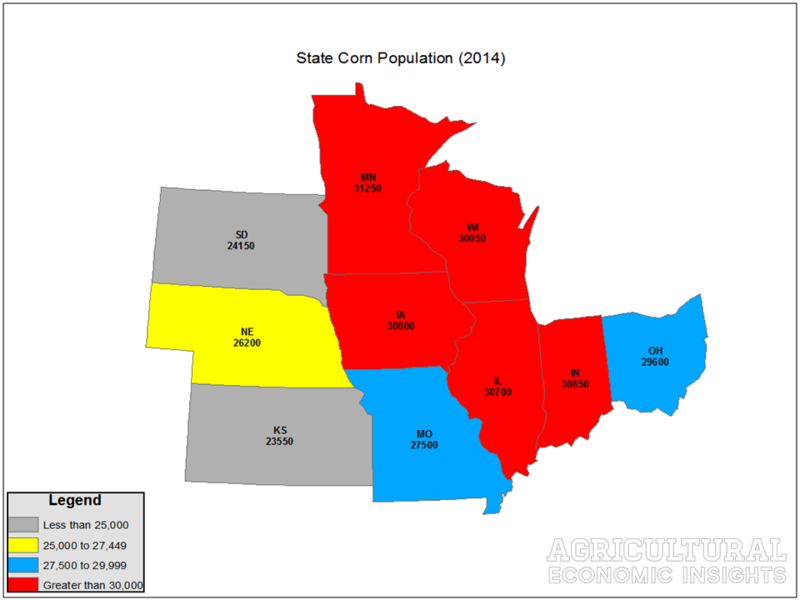 Corn Population by State, 2014. Data Source: USDA NASS. To take a closer look at recent changes in corn populations, figure 3 shows the changes in state population rates from 2004 to 2014. These years were used based on data availability. Of the evaluated states, Indiana had the largest increase in corn plant population as the state average population increased from 26,500 in 2004 to 30,850 in 2014, a 16.4% increase. On an annual basis, that is an average annual increase of 1.5%. While the rate of increase has been slow from year to year, it certainly adds up over the 11 years. Minnesota had the smallest changes in corn population, up only 7% over the period. Figure 3. 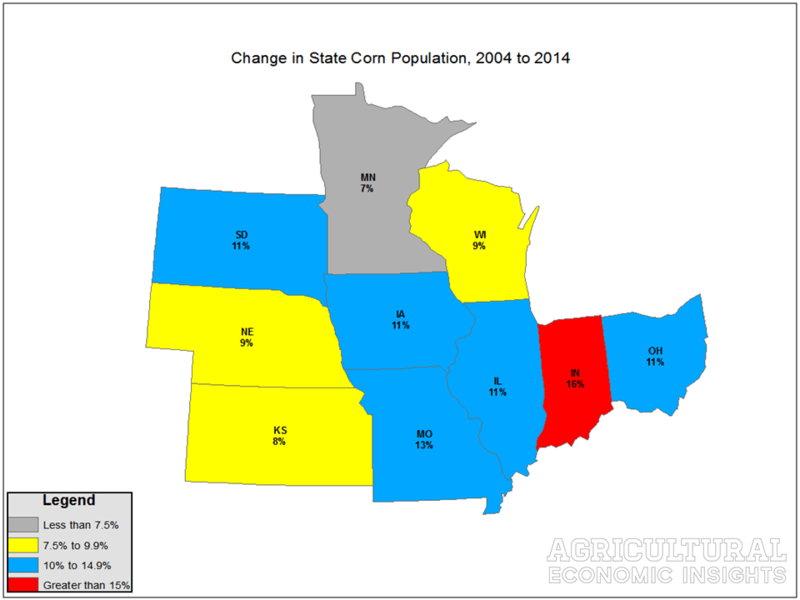 Change in State Corn Population from 2004 to 2014. Data Source: USDA NASS. In previous posts (here and here), we’ve taken a look at rising seed expenses. While seed prices are frequently mentioned as a source of these higher expense, increased plant population is also at work. Take Indiana as an example. Corn populations are 4,350 plants per acre higher in 2014 than in 2004. In a very simplistic scenario assuming corn seed prices of $300 per bag, increased population resulted in $16 per acre of additional seed expense. Overall, the trend of higher corn seed population has been slow but consistent over time (Figure 1). When looking across states, average corn populations vary (figure 2) and recent changes in population have also varied (figure 3).